Mommy This &That: Please don't stop the music! So in preparation for a New Kids concert this week I went ahead and played some of their songs to my belly. I did it during my first hour of work and boy did I get some movement! I am not sure if this is a good thing or not...the best part is it now two hours later and this baby is still kicking me like crazy! In other baby news, I can't seem to make up my mind on what colors to paint his room. I had this whole idea with wainscoting and the mocha color, but now I am not so sure. It seems in my older age I can't make a decision to save my life or my sanity! Thankfully this isn't keeping me up at night, because you know things like getting comfortable and running to the bathroom are instead, but sheesh! I always thought I had a bit of interior decorating know how, cause Lord knows my mom does but I can't seem to picture anything. And let's not talk about the crib and the color...the set I picked comes in 20 colors. All the colors are beautiful but of course of the 20, only about 4 are real options for the crib. And yet I can't decide! Maybe I should conduct a poll? I've seen the crib in white and it's beautiful! But the lady at the store said while white was great, it would be harder to have a little boy love it as he gets older. Which makes a lot of sense, right? 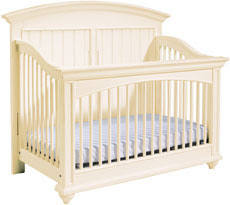 And when I originally found the crib set I was all over a color called Shell, which is a creamy beige color...only thing is I want to see a piece of furniture in the color before deciding. And then last night as I drifted off to dreamland I thought maybe going with a natural color wouldn't be so bad. Maybe this indecision is NOT old age but HORMONES??? I am also entertaining the though of forgetting about mocha and going with a blue and yellow room....AAACCKKKKK! I'm officially going to start losing my mind. Any thoughts, suggestions, opinions about the colors would be GREATLY appreciated! I'd go with the more wood look than the painted, and I am a HUGE fan of blue & yellow so I vote for that. 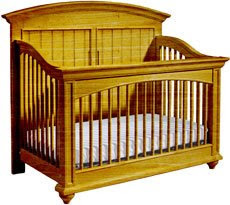 LOVE the crib - is it a convertible crib?? And don't worry too much about the decorating scheme - I am sure that one of these days you will wake up in the middle of the night and know EXACTLY what you want to do. BTW - I went to NKOTB two weeks ago. I go to alot of concerts and this was HANDS DOWN THE BEST ONE EVER!!! Enjoy! I'd say option #3. White screams girl (unless of course you choose it, then it screams All Boy, lmao). The cream color is pretty light also, so it kinda reminds me of a girl also (unless of course you choose it, then it reminds me of a boy). I always prefered the darker tones for my boys, but then again, I'm no decorator. Natural wood! I went w/ white and am regretting it. We spent big bucks on a crib and NEVER EVER used it...LOL Good luck good good luck! It looks like a convertible crib so he'll be growing up with it. As much as I love the white I'd probably force myself to go with either natural wood or a darker wood or black if they have that. As for nursery colors I love dark brown and robin egg blue. Is that too overdone? I did my youngest daughter's décor in brown and pink. Oh wait, your mocha and blue is pretty much my dark brown and robin egg blue :) I'd say go with it. I like the wood colored one. It's just the best period. That comment was from me... Love the wood. luv it. It's hormones, I'm almost sure. Hang in there. Whatever you decide, it will be beautiful. I would vote for the natural color. That's what my littlest has and I love it. When it comes to baby furniture, I just love white.